Paul McGann’s 8th Doctor takes us deeper into his stint in proceedings in the earlier days of the Time War and we see more hints at how he becomes the disillusioned man we see in Night of the Doctor. 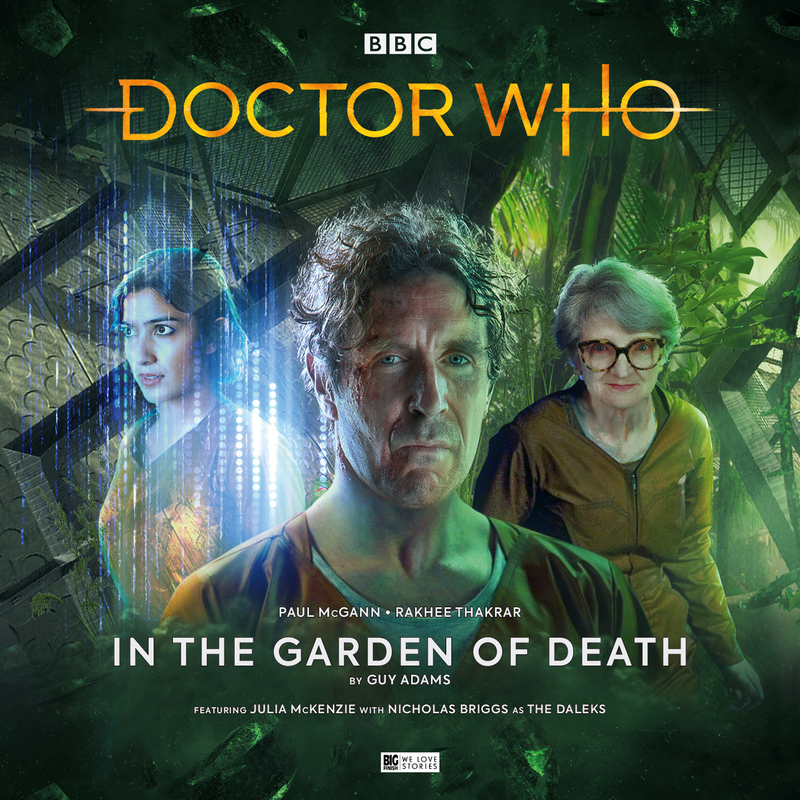 The Doctor and Bliss (Rakhee Thakrar) travel back to her home colony but all is not how she remembers it. More has changed than seems possible for the time she’s been away, or that would be if they weren’t in a “Time War”. As they unravel the mystery it seems the fight with the Daleks has now been joined by her home and no one is safe. Little do they know; there are worse things afoot that could cost Bliss everything she knows. 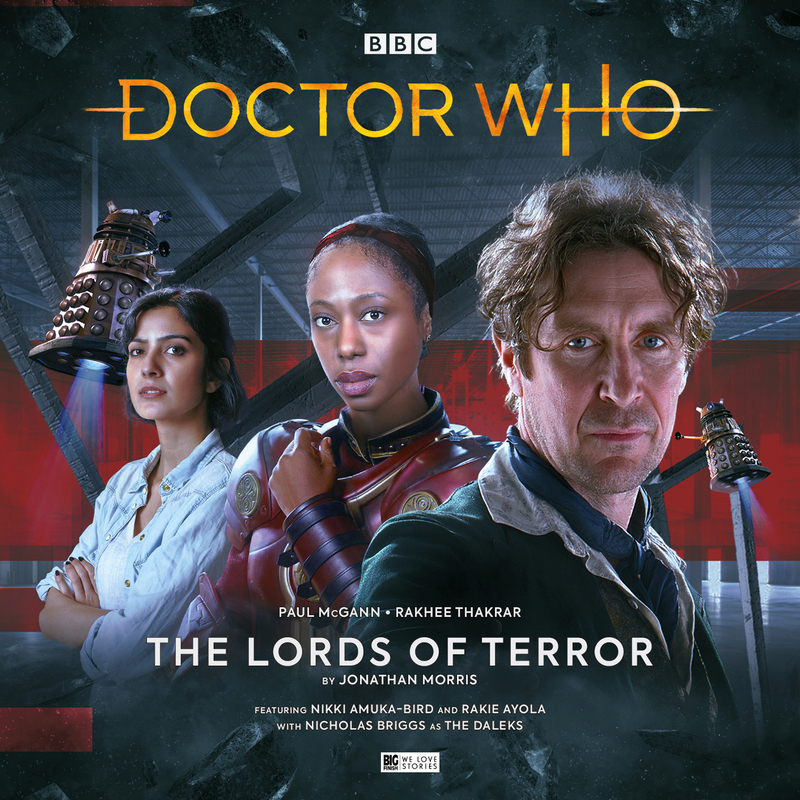 This is a fantastic story by Morris that brings in all the complexity of the idea of a Time War and explores the personal implications along with the larger scale consequences. It also does great things with the idea always present when the Time War is mentioned of what lines we might cross to make ourselves indistinguishable from the enemy we fight. 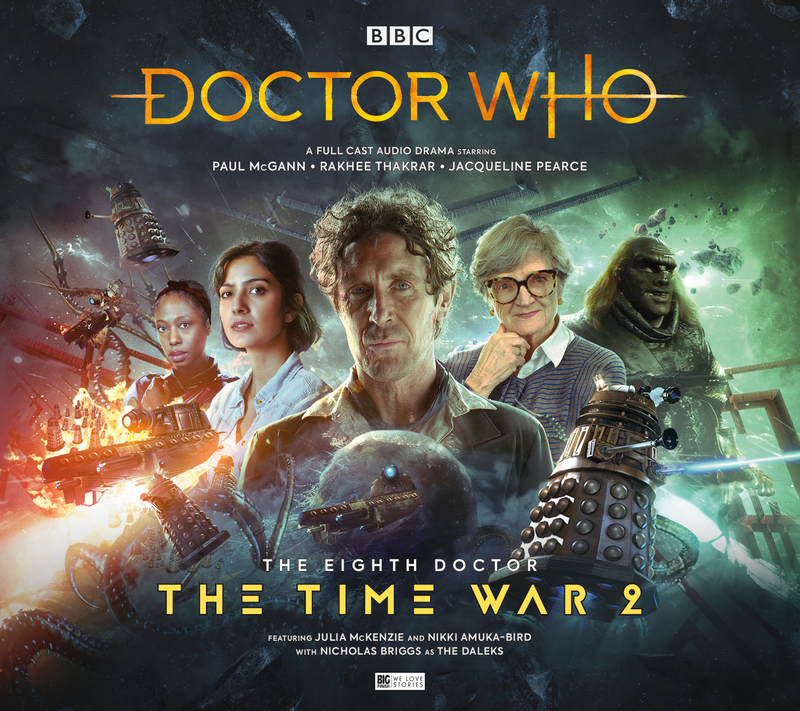 In the extras they talk of how originally the 8th Doctor was only due to get one box set in the Time War but they re wrote the ending to expand it. Although Bliss was well written for in that first set: her first entrance being really clever for a start, you can tell here they are writing for a larger character who can continue on for a while to come and Thakrar fully takes the role to the next level. The Doctor & Bliss try to avoid the Time War for a bit. But then the Twelve (Julia McKenzie); who as you might imagine is the next regeneration of the personality fractured Eleven, shows up with an Ogron dressed as the 8th Doctor when he first landed in that body, who becomes known as the Ogron Doctor (Jon Culshaw); a quiet life is the last thing he is going to get. Things become even stranger when it seems the Daleks are involved in this Doctor from another race! This one is positively Adamsian (as in it’s like something written by Douglas Adams….) in its mayhem and fun which is wrapped up in a really cool and unusual story. 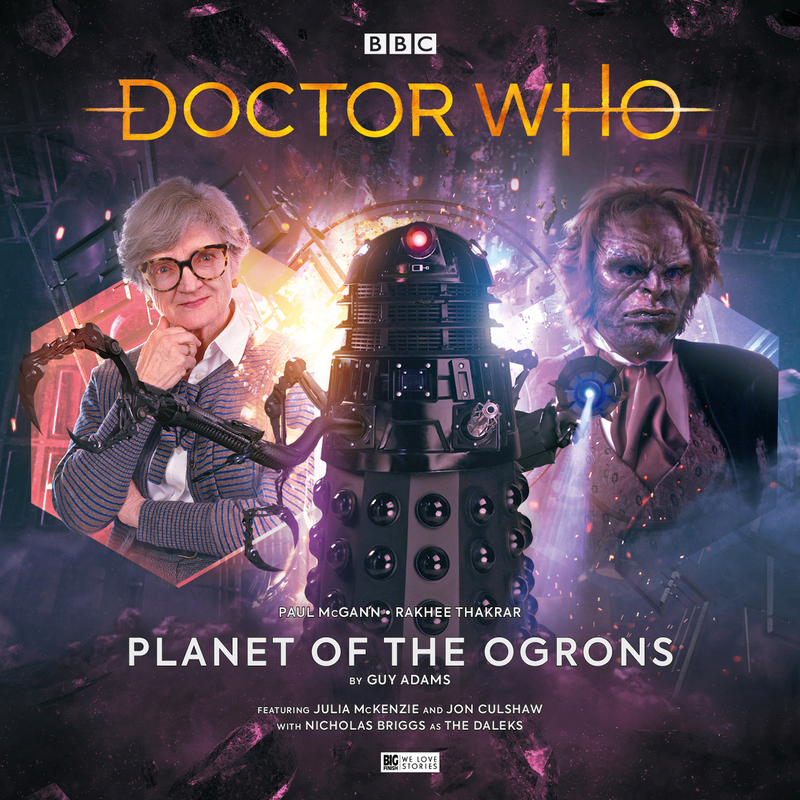 Having a big brutish animalistic creature of a man who is in McGann’s trademark Doctor Who curls, cravat and frock coat is a wonderful image that when I saw it on the artwork next to the ever wholesome looking Julia McKenzie, I knew this was a story I was going to love. Speaking of whom, what a fantastic choice for the next incarnation of the Eleven. She looks like (as she describes it herself in the extras) a sweet old lady, but she is such a great actor that you know she will do a wonderful job of all the evil, mad and eccentric past lives of the Twelve. Added to which, in this story she has control over the other sides of her personality. But is she telling the truth and if so can she keep control? The power of having someone who on the surface seems so sweet is what could that sweet exterior hide? Four prisoners wake each morning in their Dalek cells. With no memory of who they are, just instincts for things they can do. One of them is in a cage, separated at all times, only able to talk to the prisoner in the cell next to him, who is free like the others to walk around the local area, though not escape. The prisoner in the cell thinks he must be quite evil and dangerous to be given such special treatment. Being the one we know as the Doctor, the Daleks think the same of him. This is a real ‘actors story’ and a complete triumph by Guy Adams in the writing. Paul McGann gets to effectively play a different character without the Doctor’s memories, but with his enquiring mind it makes total sense he would question what kind of man he is to be given such special isolation. We are so used to everyone thinking they are the good guy, even the baddies, it’s so refreshing to have a situation where a man thinks he might be the bad guy for others to worry about. Bliss also feels like the perfect companion for this situation and helps as a catalyst to work things out. Then we have the Twelve, who now knowing the circumstances of who she is may just lose the control she has gained in her recent incarnation. Added to this wonderful cast is Victor McGuire (Bread, Goodnight Sweetheart) who we hear in the extras has been enjoying a second stage in his career in musicals of late. He is so amiable and fun in this story, which is a really good counter point to how serious and foreboding everyone else is without their memories or any idea why they are there. The Doctor, Bliss and Twelve are on a submarine on an ocean world captained by the Doctor, who has been put in command by Ollistra (Jacqueline Pierce). After the events of the last story the Twelve has a memory resurfacing that could turn the tide of the war, ironically when they are at sea. Something is in the water of this world and what Twelve remembers could be vital to making use of it, but why did the Twelve hide it in the first place? Now, I should just be able to say, the Doctor in charge of a submarine and any self respecting Doctor Who fan should be in! 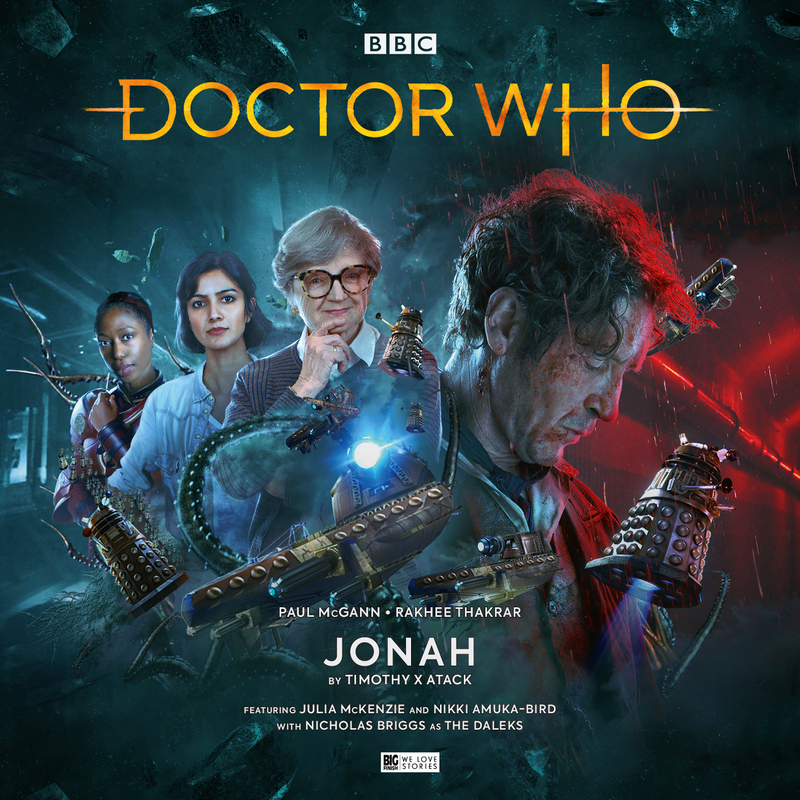 This story is in parts fun with the setting and the Doctor getting to command the vessel while Tense with what could happen with the Twelve and if everyone can survive events in the meantime. And also poignant, where the Doctor is in command and thus is put in situations where a commander must make orders that could put peoples lives at risk. Indeed the order could be to chose to go into something you know you won’t come back from. The writing by Atack and the performance by McGann gives these moments of vulnerability to the Doctor, but still shows how much he cares and is prepared to do what is needed when he must. It also in the strongest way yet talks to the Doctor knowing he isn’t a warrior but knowing all it would take is the wrong circumstances to turn him into one. One of the people I haven’t mentioned yet that deserves all the praise is Nicholas Briggs as the voice of the Daleks. It’s too easy not to realise the depth and complexities he puts into the Dalek voices usually. Here it’s impossible not to see how many different types of Dalek performance he does to show different characters within. The direction by Ken Bentley has to be given credit for the consistently great performances through-out, as well as credit going to the amazing cast, regular and guest. All of which are written for to a tee! Can’t wait to see where in the Time War we go next. 9/10. ← BBC release teaser for Doctor Who Series 11!